La Triennale di Milano presents the first retrospective exhibition of works by the English artist John Latham to be shown in a public institution in Italy (10 December 2014 – 22 February 2015). John Latham: Great Noit includes over 40 works, created between 1955 and 1998, which are among the most emblematic of his entire career. The display is both chronological and grouped by theme, thus illustrating the key aspects of Latham’s artistic research: a reflection on time, an exploration of materials and artistic media, the transformative nature of painting and sculpture, and a reflection on the possibility that reality can be represented within a single all-embracing system, be it scientific, philosophical or political. Experimentation with techniques and materials was a constant throughout his career: from 1954 until 1958 he created abstract paintings using spray paint but in 1958 he came up with one of the inventions that was most to distinguish his art. 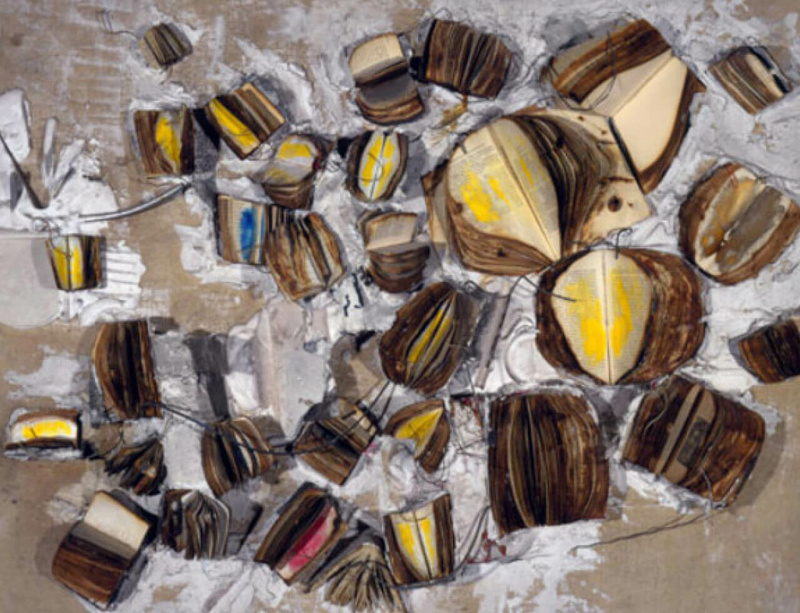 This was the use of books as a pictorial and assemblage material, which he burnt, dissected and painted. Some extremely significant examples of this series of works are on show, including Shaun (1958, from the collection of the Arts Council England), Fly Fishing (1959) and Philosophy and the Practice of (1960). These works have made a fundamental contribution to the history of painting as an “expanded” practice – one that gradually leaves the wall and becomes an installation.